The Berkshire that replaced a Mikado. Built late in the steam era, the New York Central's subsidiary Pittsburgh & Lake Erie just rostered 7 of the class. The A2a-class Berkshires of the Pittsburgh & Lake Erie Railroad is a pretty sad one. In the waning days of steam operation, the company decided that it needed to replace its World War I-vintage H7-class 2-8-2 Mikados with newer power. The railroad didn't believe there was a viable diesel on the market that could meet its requirements. So in 1945, the P&LE convinced parent New York Central to begin replacing the H7s, at first with seven new steam locomotives and only later with diesels. Due to right-of-way restrictions, the locomotives had to be designed with narrow clearances and bridge tonnage limits in mind. Alco began design work in 1947. The end result was a 2-8-4 Berkshire with better operating characteristics than the H7s, but similar to the Mikados in size and weight. The engines operated on the P&LE, were then retired, then re-activated and exiled to the Central's Big Four lines in Ohio. A footnote locomotive in the real world and something of an oddball in the O gauge world. We tested this engine 13 years ago and as time has passed, several things pop into mind about this locomotive. On the one hand the almost olive drab painting evoke the image of a US Army 2-8-0 from World War Two. There is also a certain Spartan look to it, a lack of ornamentation like the G.I. locos. There is nothing aerodynamic about the flat front. Between the smokebox and compressor shield it is almost like the engine plans on using brute force to blast its way through sleet or snow! The pilot is similarly sparse and it only has a hint of a wedge-shaped pilot. The heavy side frames on the pilot also adds to the rugged look of the steamer. While there are add-on pipes and valves, they seem to ride closer to the boiler than other models. There is some very interesting detailing on the firebox and what appears to be the water drain system. The cab is an enclosed all-weather job. Close scrutiny of the cab is where it sunk-in how much smaller this Berkshire was. The crewmen almost look too large for the model. It needs to be noted that it was designed for some pretty tight clearances so a low stack, compact cab, and probably an uncomfortable crew might be expected. The engine had all the expected detail points: cab lights, firebox glow, and painted gauges. The tender had a chunk coal load, grab irons, water hatches, and a backup light. The New York Central System graphics look superb on the side of the six-axle tender. Test track performance was satisfactory, and the only quibble I might have looking back from 2018 would be that wired tether (see how attitudes can change with technology). I would bet that this engine probably would never be re-run. It is a physically smaller Berkshire than might be expected. It was an odd-ball, seven engine class, and way late in the steam era. And quite literally, there are probably few locomotives on anyone’s layout that you can say look like it. Accordingly, I think this is a engine that fans of O gauge steam very often overlook. Built for coal hauling, the A2 would look pretty good on the front of a string of passenger cars. 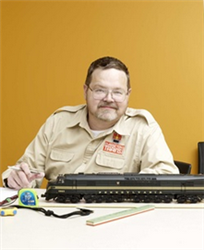 A face worthy of the cover of Trains magazine ... if they covered O gauge. Then unattractive, but stark face of the engine suggests this is no frills, get-the-job-done steam power. I know I'd abandon the deSoto on the track if this was rolling toward me! Cut off the photo by before the cab, and you'd expect to see this on the point of a military train in Europe. Note the green paint is extended to the driver counter-weights. Once wired connections were the norm. A few years later they distract from the view! The well-detailed tender includes a chunk-style fuel load, interesting wood texture on the front of the coal number, and a well done collection of hatches for loading water. This engine has a lost of things going for it, but it wasn't as famous as the other steamers on the Central. Too bad.